About a year and a half ago I bought a gym membership. For $75 per week, I can have my kids babysat at a daycare in the facility while I go and sweat among people who are a hundred times more fit than I am, in tiny little shorts, sports bras, high tech trainers and earbuds. I can do this as often as I like, for the same price. Sweet deal, right? Except, I go about twice a month. This isn’t from lac of desire, it is more lack of motivation to get the kids ready, find my things and head out to another place to run on a treadmill for an hour. The thing is, at the heart of it all, I am your typical, lazy writer. I would rather sit in front of my computer than in front of the screen of an elliptical, and I get distracted so easily that by the time I glance at a clock I have missed my window. When this led to me gaining 20 pounds last year, I knew it was time that something was done. This started my mission to find some of the best online video workout demo sites on the web, ones that I would (and do!) use myself. Each one of these I selected because they offer something special, comprehensive and easy to use. They are for anyone at any level of fitness, and with them you have no excuse not to get in your daily exercise. Even if you are as lazy as I am. Home of the 10 – 15 minute workout, these videos are gems for anyone who is genuinely so busy that they have trouble working in a break, much less an exercise routine. You have both 10 and 15 minute workout videos that are made for cardio, intensive training and core toning. They even have a quickie ab routine that will really work those muscles. They are also easily adaptable for any level, so you can work your way up. Since they don’t generally require any equipment, you can easily fit one in to the first half of a lunch break. 5Min.com isn’t specifically designed for fitness. In fact, they are not specifically designed for anything. They are a huge video site that has easy to use categories that link you to the subject of your choice. Their Fitness section is full of things for both adults and kids, which is fantastic for families. Especially as most of our kids spend more time playing video games than being active. My favorite are the stretching and pilates videos. More of a social media site, there are a ton of exercise videos on this site. You have to actually join, which can be a minor hassle. But you can also find some of the most unique instructional fitness videos on the web here, with interesting uses for every day items you never even thought of before. This really makes the sign up worth it. Especially as you can use your Facebook account to connect. This is another general website that has videos on everything under the sun. But if you want a unique perspective on fitness, this is the place to get it. From workout demos to videos about how to turn kite flying into a workout, it is all here on this great site on the outskirts of the web. It is also much easier to navigate than many other video archive directories. One of the most well known and popular resources for just about anything on the net, people still often forget about it when it comes to workouts. 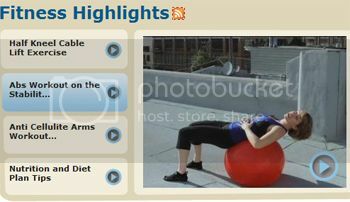 There is an entire section dedicated to exercise, and in there are some great – if basic – exercise videos. You can also get weight loss advice, learn about the body, and join a weight loss email class of sorts that will help you along the way. This is a guest post by Jessy Troy who blogs on Smith Machines and Fitness Statistics. Jessy is not a fitness pro but she loves discovering related tools and resources!